The University of Delaware held an international symposium on May 21-22 focusing on global issues and trends in agriculture, environment and bioenergy in Brazil. The Brazilian Symposium brought together a large and diverse group from the Federal University of Lavras (UFLA) and UD faculty and students to share knowledge on key themes in Brazilian and U.S. agriculture that have global impacts on food security and the environment. Those themes included agricultural innovations for global food production systems; food safety and security in the global food chain; ecology and sustaining and protecting fragile environments; and ethical and public policy issues concerning biofuels. Led by UD’s College of Agriculture and Natural Resources (CANR) for more than three years, the United States Department of Agriculture (USDA)-supported activities in partnership with UFLA have included a wide range of research projects, faculty and student exchanges, study abroad programs and collaborative workshops. Keynote address The symposium’s keynote presentation was made by Luiz Roberto Guimarães Guilherme, professor of soil and environment at UFLA, who spoke on “Brazil’s Role as a Global Food Basket: Challenges and Opportunities.” One of the big challenges Guilherme focused on was Brazilian infrastructure and transportation logistics, specifically with roads, railroads and ports. “The Brazilian minister of agriculture livestock and supply estimates losses of 10-15 percent of what’s produced due to poor infrastructure. I would say this is conservative. It’s probably a lot more than that,” said Guilherme. “Lack of infrastructure is our Achilles heel.” As for opportunities in Brazil, Guilherme highlighted the Cerrado region, an area once considered unfit for farming that is now thriving, as an example of Brazilian agricultural ingenuity. He also noted how Brazil is developing technology rapidly and utilizing renewable energy, no-till farming and dual-cropping, a practice of planting one crop right after harvesting another, such as soybeans and corn. “In Brazil, probably 10 years from now, at least 25 percent of the land is going to be used with dual-crops. This is really interesting because by doing this, you do not have to increase the area,” said Guilherme. Guilherme showed a projection that had Brazil increasing meat production by 9.3 million tons and grain production by 38 million tons by the year 2022-23, and he noted the 38 million tons was the worst-case scenario. “It could go as high as 274 million tons. But in order to do that, we have to improve infrastructure, we have to invest in research. This is not a dream. Based on what we’ve done in the last 10 years, it’s really possible. We could get this 274 million tons of grains,” said Guilherme. He noted that in order to get there, “research is really needed. 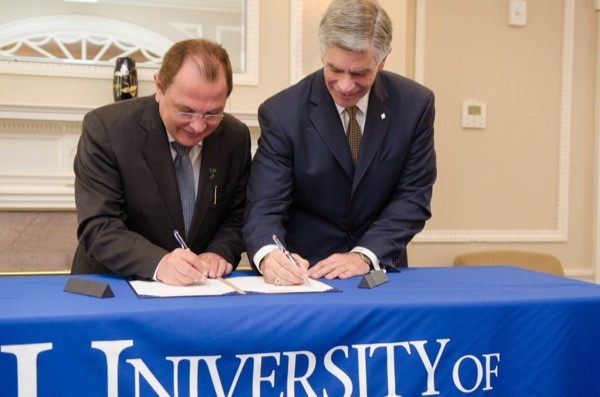 We already have a lot of research but we need much more information provided to small farmers through Extension services and additional research for those top level farmers.” Renewing agreement On Tuesday, May 20, UD President Patrick Harker and UFLA President Jose Roberto Soares Scolforo signed a renewal general agreement opening the door for further collaboration between the two universities. In attendance for the signing were UFLA representatives Research Provost José Maria de Lima, chief of staff to the president, Anna Carla Pinheiro, and director of international affairs Antonio Chalfun Jr., and UD administrators including Provost Domenico Grasso, CANR Dean Mark Rieger, CANR Deputy Dean Tom Sims, and associate professor Nicole Donofrio. 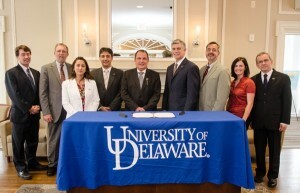 “We are excited to further our collaborative efforts with the University of Delaware,” said Chalfun. “We hope to build upon the strength of our relationship with the College of Agriculture and Natural Resources and go beyond to partner in other disciplines.” Ethics and public policy The session on Wednesday afternoon featured three talks on the ethical and public policy ramifications of biofuel production and consumption. Brazil and the U.S. are the world’s two largest producers of biofuels. Both governments have made concerted efforts to encourage the production of biofuel crops, particularly from sugar cane in Brazil and from corn in the U.S., and set goals for incorporation of ethanol into automobile fuels. Ethical questions arising from the use of crops such as sugar cane and corn to produce ethanol rather than food and the relative contribution of ethanol versus fossil fuels to greenhouse gases in the Earth’s atmosphere have stirred debate among scientists and humanists alike. Tom Powers, associate professor of philosophy and director of UD’s Center for Science, Ethics and Public Policy, and special guest speaker Paul Thompson, W.K. Kellogg Chair in Food, Agricultural and Community Ethics at Michigan State University, each discussed aspects of the debate surrounding biofuels. Thompson, in particular, focused his remarks on the upward pressure biofuel production places on food prices around the world. “Are rising food prices necessarily a bad thing?” he asked. “Between 70 and 80 percent of the world’s poor today are actually in a position to benefit from a rise in food prices because they are either farmers or dependent on a farming economy.” However, he emphasized, several factors may prevent small farmers from receiving the benefits of higher prices for their products, including their vulnerability to price volatility and loss of their land to larger investors. International efforts are underway, he said, to set standards for acceptable production of biofuels that protects the rights of poor farmers. Pedro Castro Neto, UFLA professor, also spoke about his research efforts to develop biodiesel fuel from nonfood sources, such as agricultural waste products and oily plants that are not generally used for food. Neto has set up an experimental biodiesel production facility at UFLA to study the relative merits of nonfood sources for biodiesel. Powers and Donofrio visited that facility in 2012. The future of agriculture Delaware Secretary of Agriculture Ed Kee, a graduate of CANR, attended a reception dinner for the Brazilian delegation on Monday, May 19, and said that these international partnerships are critical because “when we look ahead over the next 30 years, we’re going to have world population increase by about three billion people so to meet that food demand, it’s really critical that all the best minds of agricultural science get together and work together and do projects together to leverage not only their resources but their talents to make the progress that we need to meet the world food demand in the future.” At the beginning of the symposium, Rieger gave the opening remarks and spoke about the success that the partnership between the two universities has had over the years. He thanked Donofrio for all the work she put in to making this partnership happen. Rieger also noted that it is important to look forward to what future collaborations could bring and the need for global solutions to feed the world by increasing production without depleting the world’s natural resources. “I think that’s probably the grand challenge of our time and I think what’s really interesting is that the students in our classes today, some of you here today, will be the ones that have to solve that problem,” said Rieger. “You’ll see that in your lifetime, you’ll see that in your careers, and failure is not an option. We have to solve that problem and it will be the people with us today that are in our classrooms and that are in graduate school.” Rieger added, “So every country really needs to be involved in this, not just the U.S. and Brazil but we can lead the way through our research and Extension programs and set good examples as we lead the Western hemisphere in this.” Global partnerships Nancy Guerra, associate provost for international programs at the Institute for Global Studies, spoke at a dinner reception on Wednesday, May 21, and talked about how the program evolved from a grant funded partnership to one with multiple connections “culminating in this big conference and as you can see, it’s had a lot of impact University-wide. We’ve declared this Brazil Week and had a sorbet flavor for Brazil, we’ve had lots of arts and music and activities to showcase Brazil, and so it’s really a neat model.” Guerra added that this could serve as a model for future international collaborations, with people moving seamlessly back and forth from Delaware to Brazil. She also said that UD is now trying to move beyond bi-lateral partnerships and have multiple-level partners. “We want to have our Chinese partners working with us in Africa and Latin America and our Latin American partners working with us in China and Africa, and build these connections and these networks of faculty working in areas beyond dual partnerships, which tends to be the model that we’re using,” said Guerra. The symposium was co-sponsored by CANR, UFLA, UD’s Center for Science, Ethics, and Public Policy, UD’s College of Arts and Sciences, the Delaware Environmental Institute, the Institute for Global Studies, and the U.S. Department of Agriculture International Science and Education program. The institutions have worked cooperatively on a USDA-ISE-funded agricultural research project and UD has hosted UFLA speakers. Article by Adam Thomas, Beth Chajes and Elizabeth Adams Photos by Danielle Quigley This article can also be viewed on UDaily.